The wildfires currently burning throughout Oklahoma have taken a toll that is still unmeasured.Â This morning people are waking up to assess the damage and hope the rainfall forecast for this weekend pans out. 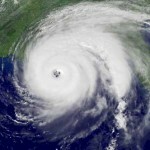 A smaller spate of wildfires in early February did less damage, but was also well-monitored by the local agencies, including the Norman National Weather Service office which posted information concerning the wildfires near the Kansas border that were visible on local radar. This week’s larger wildfires have been visible from even farther away:Â from space. 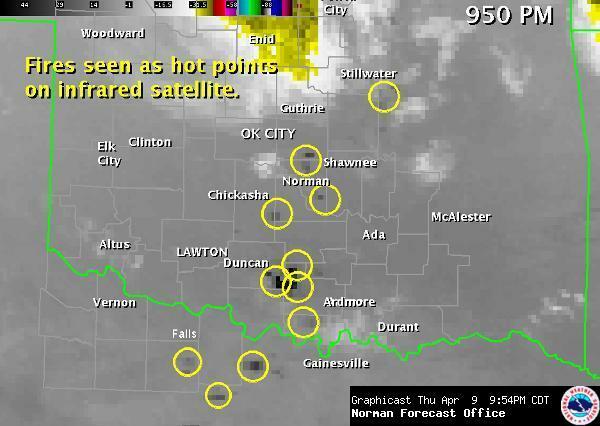 On the image above, lighter shades indicate cooler temperatures, such as the high-altitude, cooler clouds visible in the northern portion of the state and also near the Red River south of Ardmore and Durant.Â The darker shades indicate higher temperatures and, in this case, fires burning at ground level, as indicated in the yellow circles. Good news is on the way:Â Widespread moderate to heavy rain is forecast for the central Oklahoma corridor over the weekend.Â This rainfall should significantly decrease the threat of more fires in an already scorched region. 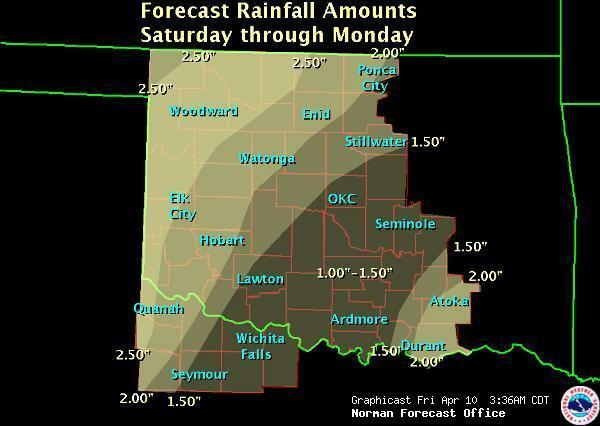 Below is the rainfall forecast from the Norman, Oklahoma National Weather Service Office.